For the past three statewide elections, beginning with the 2010 governor’s race, the winner’s margin of victory has hovered around 1%. The 2010 governor’s race saw Rick Scott defeat Alex Sink by 1.2%. In 2012, Obama received just 0.9% more votes than Romney, and in 2014, Rick Scott beat Charlie Crist by a slim 1.0%. Expectations are that 2016 will be no different. But a look back at demographic and partisan turnout and voting patterns over the past three elections finds some shifts taking place. Elections in the Sunshine State are won at the margins. Voters are generally micro-targeted by gender, race/ethnicity, age, party, and combinations thereof. Campaigns determine where to run TV ads and schedule candidate appearances by focusing on the demographic composition, voting patterns, and turnout rates of the state’s 10 media markets and the counties with the most registered voters. In the 2014 election, the Republican goals were to split the women’s vote, get 40% of the Hispanic vote, split the independent vote, and win the turnout battle. Tracking back to the 1990s, Republican victories in statewide races had occurred when these goals were achieved. The Scott campaign also focused on winning the I-4 corridor (Tampa and Orlando media markets), recapturing some of the suburban vote it lost in 2012, and ramping up vote totals and margins of victory in rural areas. The Crist campaign counted on the 2012 Obama machine and “big data” to yield presidential election year turnout rates among youth, minorities, and unmarried females—three key constituencies with histories of low midterm election turnout. Geographically, the focus was on ramping up turnout in areas with the heaviest concentrations of low-turnout Democratic registrants. Specifically, Crist spent more time in South Florida to energize black and Hispanic voters, in the Orlando area to reach Puerto Ricans, and in college towns to garner the important youth vote. When Scott narrowly won, it was evident that Crist’s efforts to produce presidential election-year turnout among young, minority, and female voters fell short. Democratic turnout in vote rich South Florida lagged again, as it had in the 2010 governor’s race. 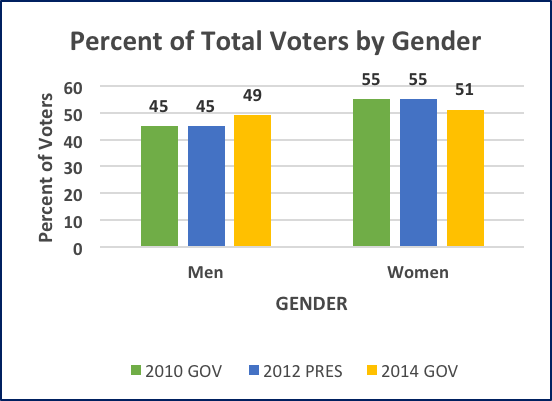 Women as a share of the electorate fell from 55% in 2010 and 2012 to 51% in 2014 (Fig. 1).Heading in to the election, Democrats were projecting that females, including young unmarried women, would turn out at the same rate as in the 2010 midterm and 2012 presidential races. That did not happen in spite of the fact that in 2014, there were 10% more females registered as Democrats than Republicans. Among women who actually voted, there was party parity: Democratic women were 18% of total voters and Republican women were 18% (exit poll data). In 2014, the women’s vote was more divided (Crist 49%, Scott 47%) and the gender gap was considerably narrower than expected by the Crist campaign (women, Crist 49%; men, Scott 49%. Two years earlier, Obama won 53% of the women’s vote to Romney’s 46%. The gender gap was 10%. And in 2010, Alex Sink garnered 52% of the women’s vote to Rick Scott’s 45% (Table 1). Unmarried women—a key target of the Crist campaign— made up a smaller portion in 2014 (22%) than in either 2010 (38%) or 2012 (26%). Among unmarried women, 63% voted for Obama in 2012 and 60% for Sink in 2010, but only 54% voted for Crist in 2014. Some Democratic strategists have speculated that the intense ad emphasis on reproductive rights and abortion was less effective than in 2012. Other Democratic women refused to vote for Crist because of his unwillingness to debate Nan Rich, but they could not vote for Scott either so they simply bypassed the governor’s race. And compared to 2010, Alex Sink, who would have been Florida’s first female governor, had broader support among women than did Crist. Source: Exit polls conducted by Edison Research for media, CNN reports. Source: Exit polls conducted for media by Edison Research, CNN reports. 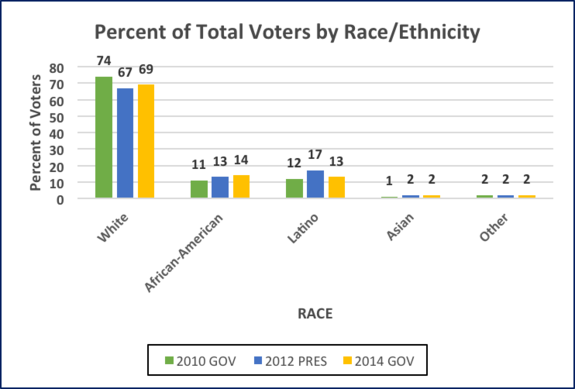 In 2014, there were slightly more Hispanic than black registered voters (15% v 14%). Both groups, albeit different subsets, were heavily targeted by Crist and Scott. Hispanics. Both sides fought hard for the growing Hispanic vote. In spite of intense efforts, the Hispanic share of the electorate fell from 17% in 2012 to 13% in 2014. It was 12% in 2010. Crist did not get the big gains from the Hispanic vote that he had anticipated, especially with the selection of a female Hispanic (Colombian) running mate, Annette Taddeo. Although Crist won the Hispanic vote, he received 2% less of the overall Hispanic vote than Obama (58% v. 60%). Crist’s 20% margin was impressive, but Scott’s 38% came close to the 40% Republicans say they need to win statewide races (Table 2). In 2014, the debate over the relative size and voting patterns of Cuban v. non-Cuban Hispanics intensified and even involved candidates for Lt. Governor. While Taddeo spent more time appealing to non-Cuban Hispanics across the state, especially Puerto Ricans in the Orlando area, Scott’s running mate, Cuban-born Carlos Lopez-Cantera, campaigned heavily among the south Florida Cuban population. The exit poll by Edison Research showed that Crist won 50% of the Cuban vote to Scott’s 46%. These figures were heavily challenged by the Scott campaign. A post-election survey, conducted for the Republican Party of Florida by OnMessage Inc., reported that Scott won the Cuban vote over Crist 65% v. 30% AND lost the Hispanic vote overall by just 2% rather than 20% (Table 3). conducted November 10-12, 2014 by OnMessage, Inc. Blacks. Blacks made up 14% of all voters in 2014 compared to 13% in 2012 and 11% in 2010. 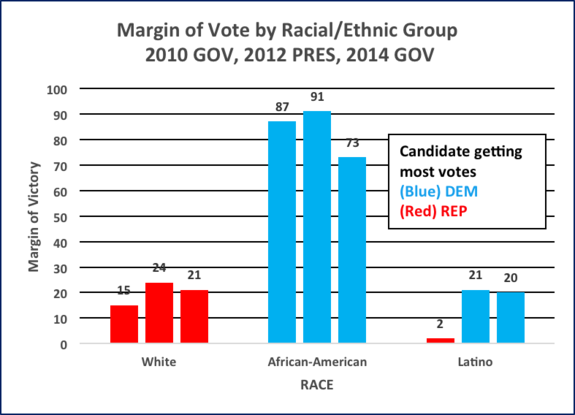 While efforts to increase black turnout were more successful than for Hispanics, the black vote was less cohesive than in either 2010 or 2012. Scott doubled the percent he won in 2010 (6% v. 12%) and greatly bested the 4% of the black vote won by Romney in 2012 (Table 2). Scott made inroads into the Caribbean American vote by spending time in large evangelical Haitian churches and appearing on Haitian radio stations, appealing to black parents in favor of tax credit scholarships, and garnering support from black entrepreneurs. Generational voting patterns in Florida are changing. 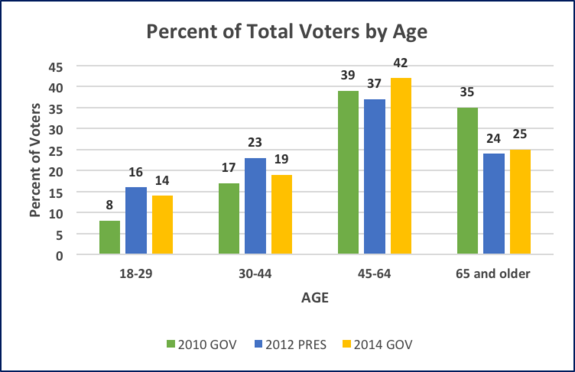 Among registered voters in 2014, 52% were 50 years of age or older, while 48% were under 50. In a reversal of what was true several decades ago, the oldest cohort is now the most solidly Republican voting bloc, while the youngest is the most Democratic. A larger share of young than old voters register as independents, and younger voters were more supportive of Libertarian Adrian Wylie. Exit polls showed that Wyllie’s votes came disproportionately from younger voters—a higher proportion of whom would most likely have gone for Crist than Scott. Among 18-24 year olds, Wyllie got 10% and among 30-39 year olds, 6%. Wyllie pulled a lot from the Tampa Bay area where he made many personal appearances, including the University of South Florida campus, and got more extensive TV coverage in regular newscasts. The youth vote (18-29 year olds) never materialized for Crist the way the Democrats envisioned it. Their share of the electorate fell from 16% in 2012 to 14% in 2014 (Fig. 5). Amendment 2 (medicinal marijuana) was not the turnout driver it was expected to be. 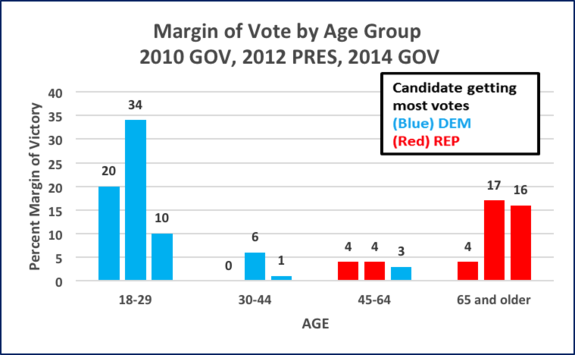 Plus, the GOP made some in-roads with younger voters; a slightly higher percentage of 18-29 year olds voted for Scott (41%) in 2014 than in 2010 (39%), Table 4. This pattern was consistent with that of Millennials across the country drawn to the GOP by economic issues (jobs). Note: Republicans do better among younger voters when moral issues are not at the forefront. Nothing tells the story of the 2014 governor’s race quite as clearly as the failure of Democrats to get their supporters to the polls at the same rates as in 2010 and 2012. 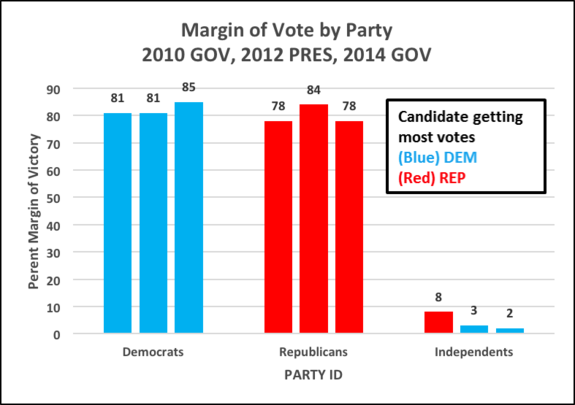 Although Democrats have consistently held around a 4% edge in registration over Republicans, their share of voters declined in 2012 and 2014, falling below that of both Republicans and independents (Fig. 7). 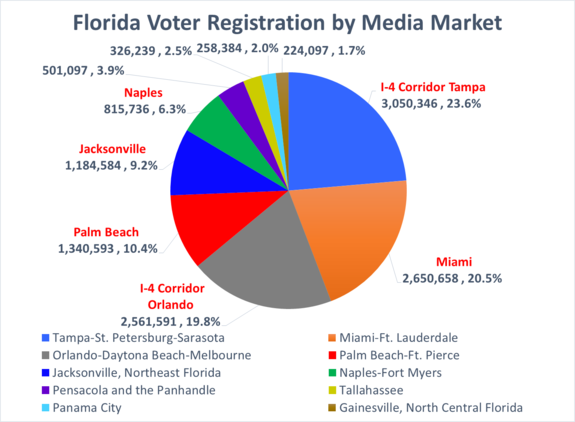 The I-4 Corridor media markets (Tampa and Orlando) combined serve 44% of Florida’s registered voters (Fig. 9). These two markets are the most competitive from a partisan perspective—nearly evenly divided in both registration and voting patterns. In the sizable (9% by registration) Jacksonville market in the northeast, Republicans, despite having only a slim registration advantage, have steadily improved their election outcomes. 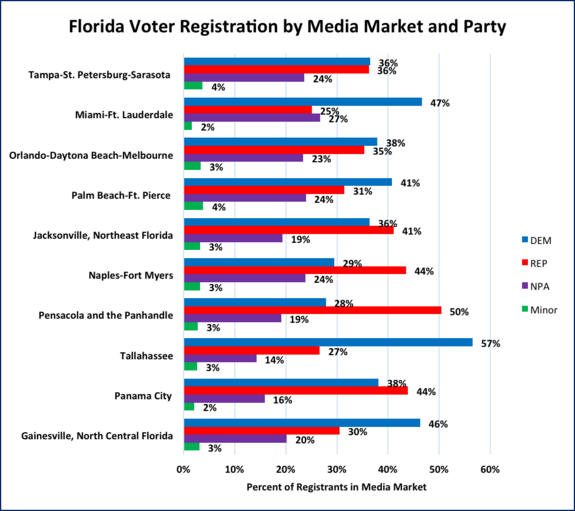 The two largest and most heavily Democratic markets in southeast Florida, Miami and West Palm Beach, reach nearly a third (31%) of the state’s registrants. 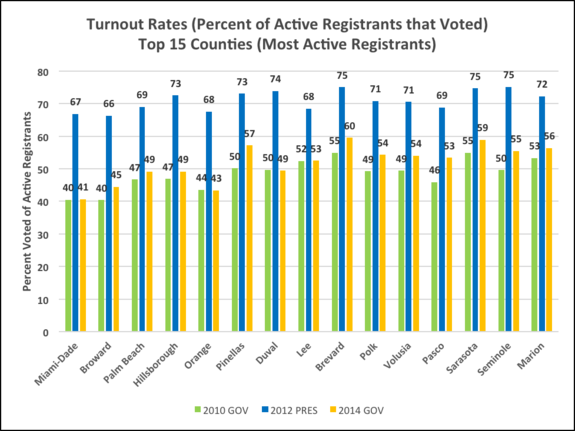 The smaller, but heavily-Democratic leaning college-town markets, Tallahassee and Gainesville, broadcast to 4% of all registered voters. Airwaves in the three heavily Republican-dominated markets, Naples in southwest Florida and Pensacola and Panama City in the rural Panhandle, reach 12% of the state’s voters. Scott ended up narrowly winning the I-4 Corridor markets, while winning the Republican-dominated markets by wide margins (Fig. 11). 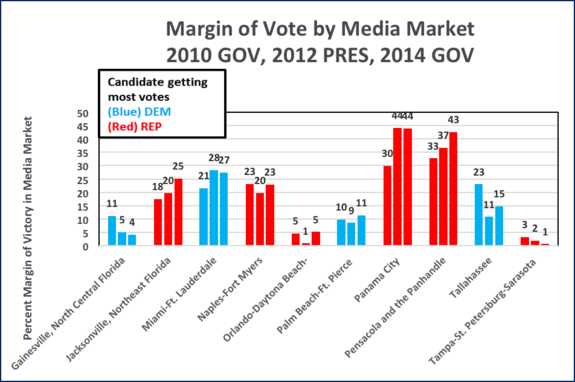 Crist performed relatively poorly in two Democrat stronghold media markets in North Florida; after Alex Sink in 2010 won in the Gainesville and Tallahassee media markets by 11% and 23% margins, respectively, Crist slipped, winning by only 4% and 15%, respectively (Fig. 12). 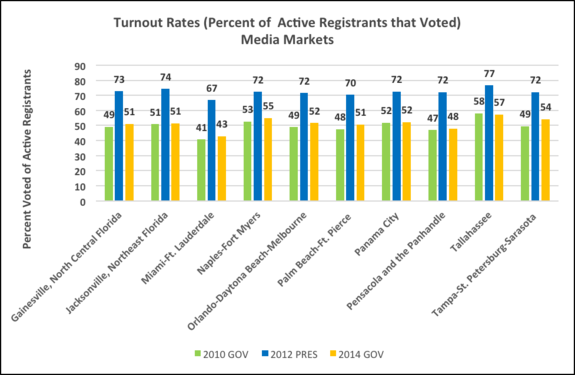 Democrats suffered badly from low turnout in the big Miami market (Fig. 13). (The turnout rates in the heavily populated Democratic strongholds of Miami-Dade, Broward, and Palm Beach counties were well below the overall state rate—50%) (Fig. 15). Some Democrats are still of the opinion that a last minute appearance by President Obama in South Florida would have helped boost Democratic turnout there considerably more than the President’s robocall for Crist in the “eleventh hour” after early voting was over. Voters in heavily urban areas supported Crist but made up less than half (47%) of all voters, while a majority of suburban and rural voters chose Scott. Suburbanites comprised 45% and rural registrants 8% of all voters (exit polls, Fig. 11). The suburban vote tilt in 2014 (52% for Scott) surely disappointed Democrats who saw Obama carry that geography (51%) in 2012. The Scott campaign’s jobs message resonated with these suburbanites (male and female), many of whom were still struggling economically job-wise and home mortgage wise. 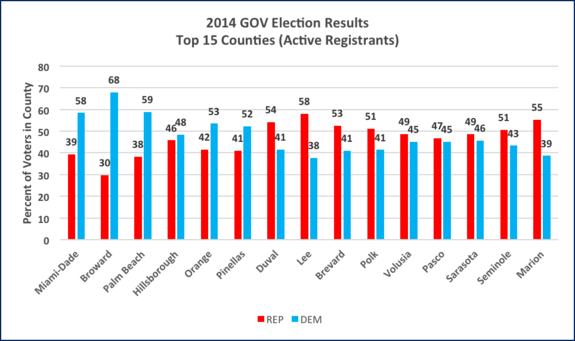 Source: Calculated from August registration data provided by the Florida Division of Elections. Source: Calculated from election returns posted by Florida Division of Elections. Note: In 2012, categories were worded “City over 50,000,” “Suburbs,” and “Small city and rural," respectively. Source: Exit polls conducted for media by Edison Research, CNN (2014) and NBC (2012) report. It is a well-known fact that the overall turnout rate for midterm elections is substantially lower than for presidential elections, which generate more public interest. But it is also true that some of the shifts in the vote patterns of specific groups within the electorate observed in this three-election analysis raise some interesting questions about the upcoming 2016 presidential contest. 1. 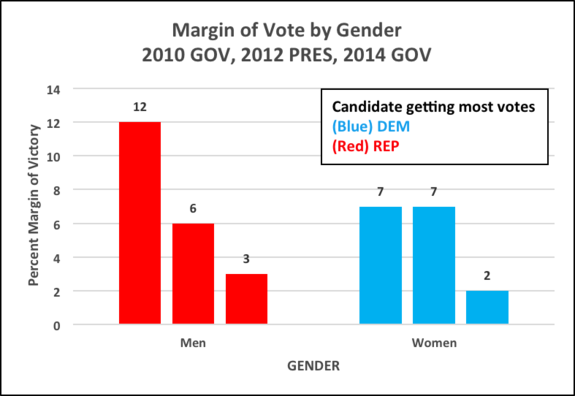 After the women’s share of the electorate fell in 2014, will Hillary’s presence on the 2016 ballot, if she runs, bring more women to the polls as Sink did in 2010? 2. How will the impact that the race and gender of presidential candidates (although, interestingly, not the same impact for running mates) on turnout patterns influence both parties’ selections for the faces of their parties? 3. As non-Cuban Hispanics outpace Cubans in registration, will the Latino vote be more Democratic and make up a larger share of those who vote than in 2014 when Democrats suffered low turnout in Hispanic areas? 4. Will the rising number of Caribbean black voters decrease the cohesion of the black vote? 5. What will Democrats do to stop the loss of young voters, many of whom now identify as independents, and address the shrinking margins in markets like Gainesville? 7. What will Democrats do to appeal to the increasingly Republican senior voters? 8. 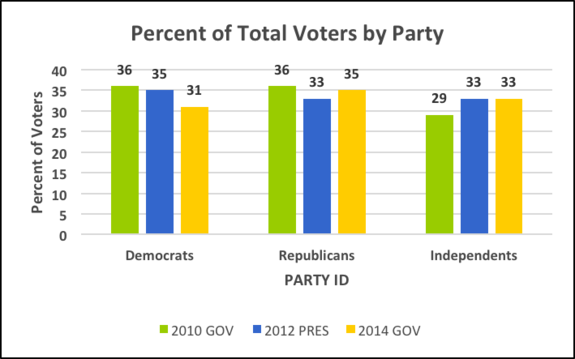 *With Democrats experiencing a consecutive decline in vote share, what will the party do to attract independent voters, who outnumbered Democrats at the polls in 2014? 9. *What will both parties do to win the increasingly competitive struggle for the Tampa media market, which Scott won by a mere 1% in 2014? 10. 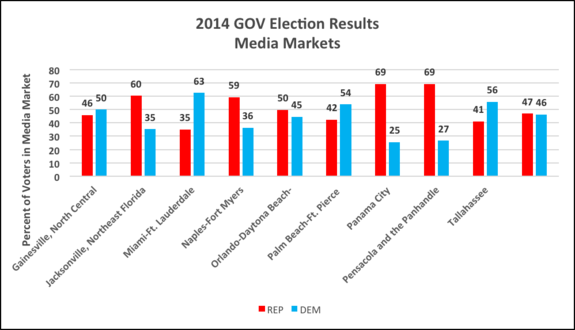 *Will Democrats continue to neglect (candidate appearances) Jacksonville and the Panhandle as Republicans win in these North Florida media markets by greater margins? *The trends most likely to transcend the divide between midterm and presidential elections.